The final stop on our Spring Break 2014 vacation was Mount Nebo, a favorite of mine for its vistas on all sides. I have visited it several times and hiked all of its trails, but I had never stayed overnight up on the mountaintop. This time I rented the Overlook Cabin #61 for Wendy’s first trip to this state park, and it did not disappoint. We made two short hikes along the north and west edges of the mountain during our stay. At the visitor center we found a convenient stand for a timed photo at the overlook above Lake Dardanelle with Arkansas’ Nuclear One in the background. We then walked the Rim Trail over to Sunset Point. 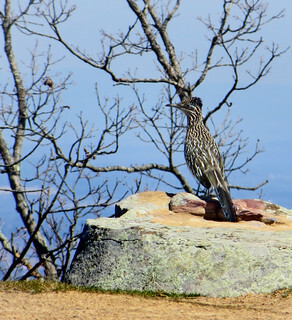 Wendy found a heart rock along the way, and we enjoyed watching and listening to a roadrunner which was hopping about the edge of the bluff, eyeing us warily as we struggled to imitate its call. We then drove over to Sunrise Point, where I posed out on a rock ledge and admired the cones in a pine tree before charging back up the slope to where Wendy sat, guffawing at my energetic style. 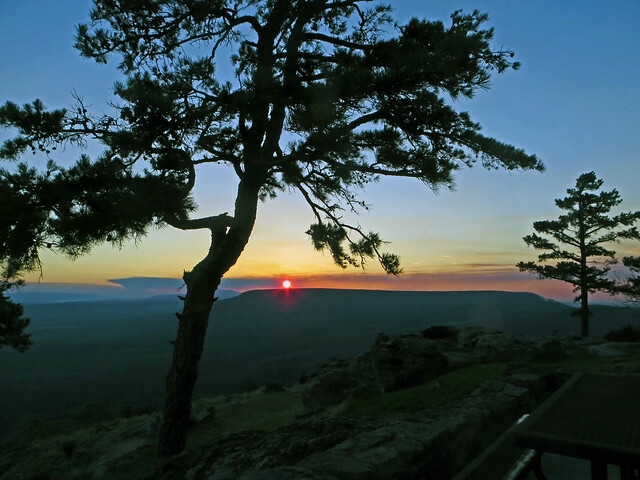 Our cabin was perfectly perched along the Rim Trail on the southwest edge of the mountain with its wonderful patio providing a gorgeous view of the sunset with a pine tree in the foreground. In the cabin kitchen I noticed that the refrigerator doors opened inconveniently and was commenting to Wendy on how simple it would be to reverse them as I opened the freezer door. An ice pack I had placed in the freezer door slipped and pulled a support right out of the door, and I clutched at the falling items frantically, making a huge racket and sending her into gales of laughter at Mr. Fix-It’s dilemma. 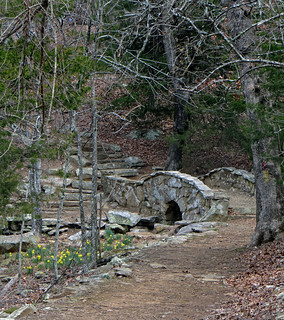 The last day of our Arkansas vacation was overcast as we made a loop on part of the Summit Park and Rim trails, climbing up to the stone bridge to cross it and reach Lovers’ Leap. We enjoyed our brief stay at Mount Nebo so much that we pledged to return. Arkansas was a great choice for our Spring Break and I’m sure we’ll both be daydreaming about it for awhile. Hi Granger. I believe I would possibly like to use one of these photos (back of #61 cabin) for an idea. Do you care to email me if I may have your permission to use it? 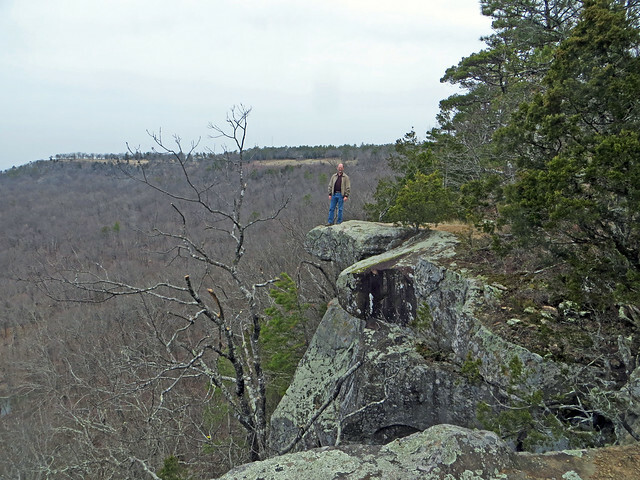 holly.moore@arkansas.gov I work atop Mount Nebo State Park in Dardanelle, AR. Of course! We love Mount Nebo, and are grateful to everyone who works there!